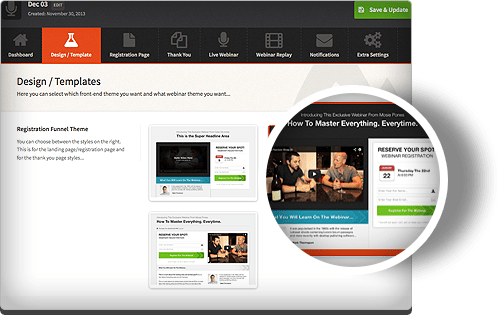 WebinarIgnition is the most flexible platform for creating professional live & automated webinar funnels. 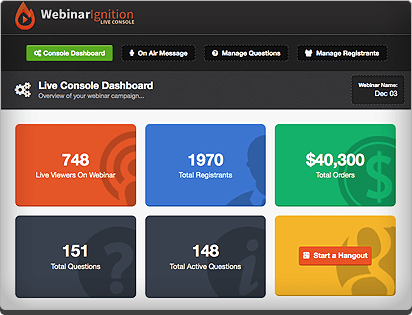 What Can You Do with WebinarIgnition? 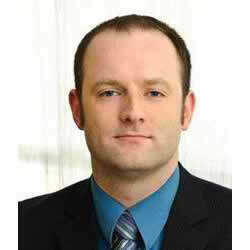 Run engaging, high-converting live webinars. Create evergreen webinars that run 24/7 on your website and sales funnels. Start building a list of targeted prospects and buyers, as each registrant can be added to your email list. Our ‘Live Console’ allow you to easily managing questions, call-to-action messages, and detailed reporting. WebinarIgnition Has Loads of Features! WebinarIgnition integrates with the WordPress CMS, making it super easy to install and manage your webinar campaigns directly from the WordPress dashboard. 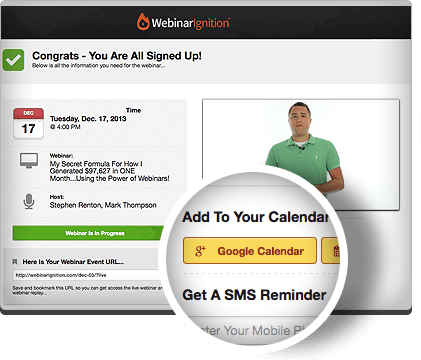 WebinarIgnition can integrate with any email auto-responder including top providers like GetResponse, Aweber, iContact, SendReach, and MailChimp. Allow visitors to register via their Facebook login. Embed any video feed such as Google Hangouts, LiveStream and Ustream into your Live or Automated Webinar Page. We provide professionally designed templates you can utilize to create your webinar pages. Each template can be fully customized with branding options, color options, show/hide elements, and lots more. 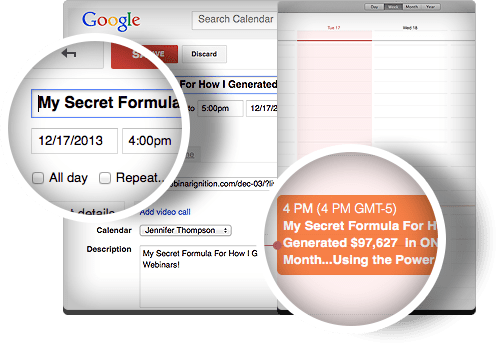 Once the user has registered for the webinar, they can now easily add the event to their Google Calendar, iCal or Outlook with the push of a button. 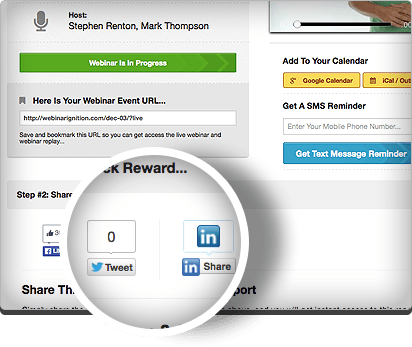 Add a viral sharing feature on the confirmation page that will encourage your registrants to share your webinar on Facebook, Twitter, Linkedin and/or Google+. Give each registrant a gift for those who share on one of the social networks. Utilize our "Live Console" as your hub to easily manage your live webinar as it is happening. Monitor the number of attendees on your webinar in real-time, total sales/revenue, questions and more! Also push an "On-Air Message" to your attendees during your pitch to get them to take action. Manage everything you need to know about your webinar registrants, including vital insights like if they attended your live event, watched your replay and if they purchased. 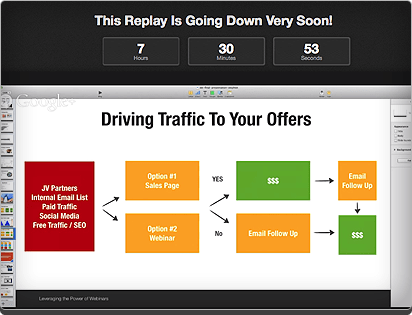 Easily export the "Hot Leads" of which are people who attended and watched your replay, who are most inclined to buy. 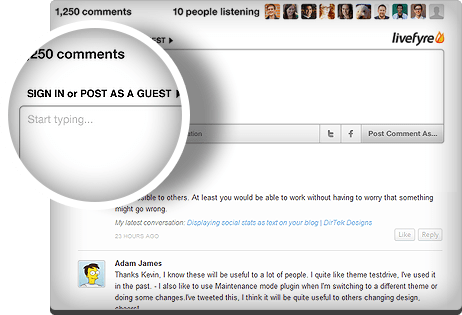 Monitor and reply to questions as they come in during your live webinar. Each mark questions as read, once you have responded or delete questions of which you have answered already. 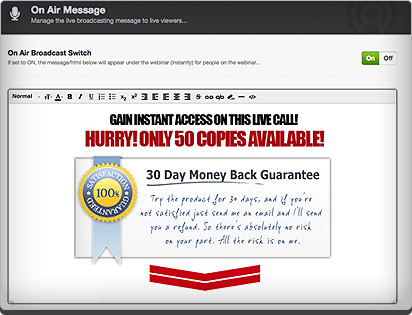 The "On-Air Message" feature allows you to push any Call to Action onto your live webinar page when you are ready. Perfect for when you are pitching your product. Push a CTA button or push any HTML that you would like. Use our email and text notification system to dramatically increase your attendee rate for your webinar. Schedule your email notifications at specific times, along with all of their important webinar details. Our email notification system integrates with any SMTP service, delivering reliable and fast email reminders. Our text message system integrates with Twilio, to send text message reminders for pennies. 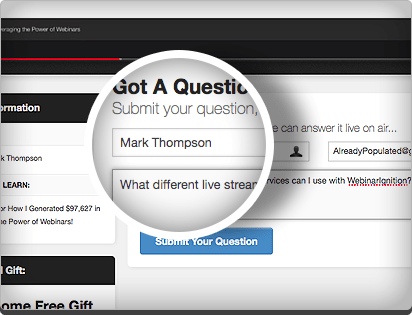 We provide the flexibility to have either a Questions box or Live Chat area on your live webinar page. Depending on the type of webinar you are hosting, you may find that one or the other will suite your goals better. 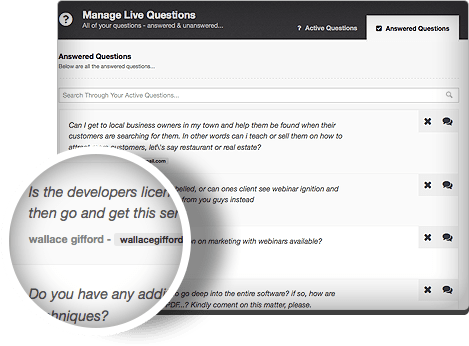 If using our Questions box, we automatically populate the users Name and Email into the box, making it super easy to identify who is asking each question. If using the Live Chat feature, it can integrate with any live chat service like iFlyChat. 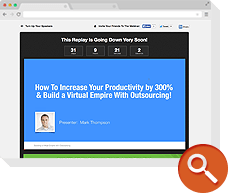 Create scarcity for your webinar replay by adding a countdown timer at the top, of which will drive your registrants to take action and watch your replay now as appose to later. Automatically close down your replay once the timer hits 0. Monitor unique visitors, webinar registrants, attendees, sales and conversions from our Live Webinar Console. Host and charge your registrants a fee to attend one of your webinars. Integrates with virtually any payment gateway. Register 100% of your subscribers for a webinar with the click of a link. 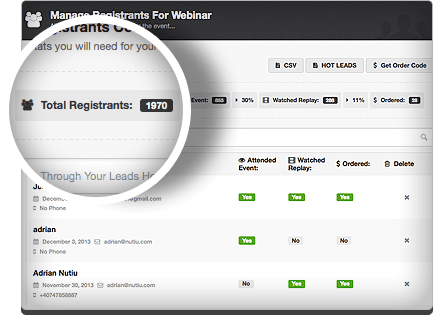 As soon as someone clicks a link in your email, it will automatically register them for your webinar event. 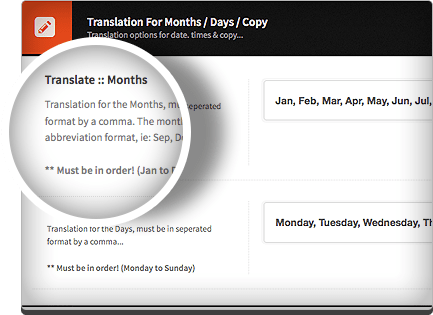 Export all of your campaign settings and import them to ANY site of which has WebinarIgnition installed on it. Add this responsive / adaptive widget that can be placed on any page / post or sidebar to generate registrants for your upcoming webinar. 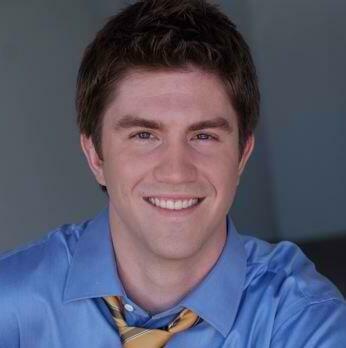 "Webinars have helped us build NicheProfitClassroom.com into a 7-figure a year business. 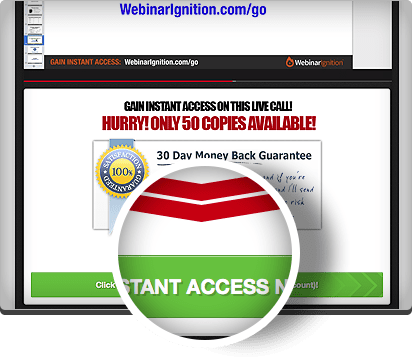 WebinarIgnition is by far, the most robust webinar solution with lots of amazing features to help create and manage high converting webinar funnels. The days of paying $500/month for webinar software is over!" "This is the missing piece that Google never added when they created Hangouts. For anyone looking to run webinars in their business, this is a must have tool. The team behind WebinarIgnition are some of the best in the business and stand behind the product with ongoing feature enhancements and excellent support. We highly recommend it!" 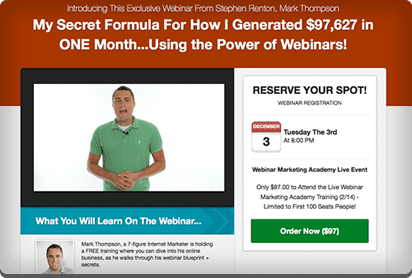 Is WebinarIgnition a monthly recurring payment? No! WebinarIgnition is a one-time fee. Pay once and you own the software for life. How do I install WebinarIgnition? WebinarIgnition works with any WordPress site as a plugin, so you would simply install it like any other WP plugin and you are ready to go. It does not conflict with your existing theme. Yes, our support staff is here to help you if you have any questions or concerns. We also provide in-depth training and tutorials inside the members area. © 2019 WebinarIgnition | The Most Powerful Webinar Platform for Live & Automated Webinars .All rights reserved.